As per Sthalapurana, Devas assembled here and discussed, hence the name TirutthenvarThogai. The Garuda seva on the day following Thai Amavasya is very famous. Direction and Posture Standing Posture and West-faced. Access to the temple About half-a-mile from Thiruvali. The Moolavar of this Divyadesam is Daivanayakan. He is giving his seva Nindra (Standing) Thirukkolam facing his thirumugham towards west direction. 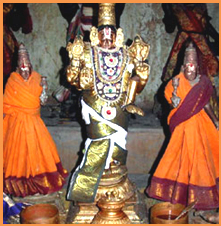 Prathyaksham for Vashista Maharishi. This place is near to Thiruvaali Kshetram of Tanjore district in Tamil Nadu. It's about 4 kms south east ot Seerkazhi Railway station. Can drop at Thiruvaali by bus of Thiruvennkadu route. There is no place for stay.